Stackoverflow is part of StackExchange, a “Q and A” platform. At this time it has 2.5 MLN users. The site Stack Overflow Careers 2.0 offers the users to share their professional information if they are open to new possibilities. Search for these profiles is paid for employers and recruiters. However, you can X-Ray the site (for free). Here’s what a profile on the “career” site looks like. Once you have found a profile, there shouldn’t be any problem finding additional professional information (if you need it), based on the shared links to social sites, the profile image, the name, and the location. We can see (interpret) these pages in the same way as resumes on job boards: recent are for active candidates, past are for “passive”. Naturally, when you view the profile showing “3 days ago” in the preview it may be, say, 6 days since it was updated. This gap in dates gives us some idea on how often Google visits the pages. If you are interested in many more practical ways and examples of sites to search for Software Engineers, feel free to check out the materials for the latest webinar, exactly on that topic. Thanks for the article! Updating a profile can be a strong indicator that someone is about to make a move. I find it helpful to narrow down the geography as well. For example. 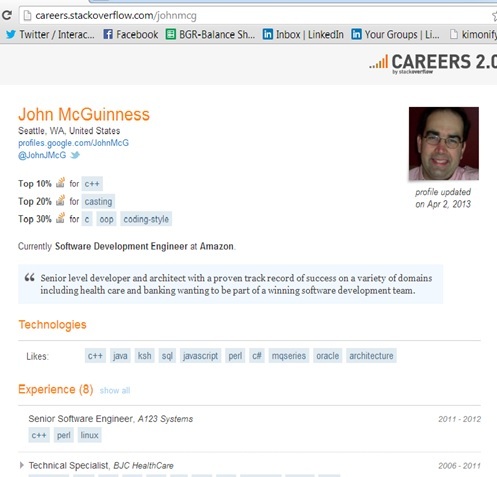 site:careers.stackoverflow.com -inurl:jobs profile updated ..2 days ago “washington d.c.” gives me the candidates in my market that updated their profile 2 days ago. I can save my search string and run it on a regular basis and keep tabs on candidates that might be making a move in my market. Yes, Mike, thanks for the comment. Unfortunately, Google Alerts seem to be broken (since mid-last year), so running the search on a regular basis does sound like a good idea.